Popular culture is an expression of a country’s distinctive traditions, history, and language, as well as its current social, economic, and political systems and its degree of technological development. How events, institutions, and artists/performers shape popular culture and how in turn popular culture shapes the lives and identities of cultural consumers is a complex reality that defines much of contemporary life. Globalization, multiculturalism, and diversity provide additional lenses through which to think about popular culture. Does American popular culture support a bland collection of homogenous Americans living uniform lives in gray suburbs or a rich cacophony of cultural voices that clash, “crash,” and co-mingle along lines of race, ethnicity, class, religion, and sexual orientation? To what extent do forms of popular culture express and inculcate dominant social values and support existing institutions? To what extent can popular culture provide a means for challenging such values and institutions? The degree to which the United States and other nations export their cultures produces new sources of cultural tension, resistance, and creativity. During 2009-2010, The Clarke Forum will explore these issues in a number of different contexts and from a variety of different perspectives. Stern Center, Great Room, 7:00 p.m.
Do-gooder intentions go disastrously wrong when Hollywood gives a young Iraqi film student the chance of a lifetime. Operation Filmmaker tells the fascinating and riveting story of this student’s odyssey in the West, which has uncanny parallels to America’s recent misadventures abroad. Many Americans expected Operation Iraqi Freedom to be a quick intervention welcomed by the Iraqi people. Yet, over six years later, an American occupation continues. Hundreds of thousands of Iraqis and over 5,000 Americans have perished in the conflict since 2003. Millions have become refugees and sectarian violence persists. Our initial expectations were upset; our ignorance of Middle Eastern culture exposed. Inspired by the 2003 MTV profile of Iraqi film student Muthana Mohmed, American actor Liev Schreiber invited the young man to intern on a Hollywood movie set. Documentary maker Nina Davenport immediately saw an opportunity: she would tape Muthana’s Hollywood internship. “I thought the film would be called The Kindness of Liev Schreiber,” she later said. However, cultural differences between the young Iraqi and his co-workers proved greater than expected. A project that was only supposed to take a few months turned into a yearlong endeavor, as Operation Filmmaker began to resemble another instance of good American intentions gone awry. * Faragallah, Mona H.; Schumm, Walter R.; Webb, Farrell J. “Acculturation of Arab-American immigrants: an exploratory study.” Journal of Comparative Family Studies (1997). After studying photography and filmmaking at Harvard College, Nina Davenport completed her first film Hello Photo, a poetic travel documentary about India, which premiered at Rotterdam and won “Best Documentary” at the Melbourne International Film Festival. Her second film Always a Bridesmaid – described by the Hollywood Reporter as “dripping with artistic merit” – was autobiographical, and aired on Cinemax/HBO and Channel Four in the U.K.
Operation Filmmaker, her most recent film, first screened as a work-in-progress at the Rotterdam International Film Festival in 2007, where it won the prestigious KNF Dutch Film Critics Award, and later premiered at the Toronto International Film Festival. Davenports unique and personal style of documentary has earned her numerous filmmaking awards and grants. She grew up in Bloomfield Hills, Michigan and lives in New York City. Stern Center, Great Room, 4:30 p.m.
Bob Dylan popularized Eric Lott’s book by putting its title on his 2001 album “Love and Theft.” Dylan’s “lift” of the title reflected Lott’s view that appropriations are fundamental to popular culture and that artistic creativity has an important bearing on education and identity formation. Following Professor Lott’s talk, there will be a barbecue and concerts by Structure of Feeling and Black Landlord, named the “best local band” by Philadelphia Magazine in August 2009. Concerts are co-sponsored by The Division of Student Development, the Office of Campus Life and the Multicultural Organizational Board. Cultural theorist Raymond Williams claims that culture is “one of the two or three most complicated words in the English language.” Certainly the meaning of the term is highly contested. • “Mass culture,” that is, commercial culture produced for mass consumption. Despite the controversy over the meaning of the term, there is little doubt that “popular culture” is an important dimension of American life. Technological developments in the radio, television, film, and recording industries, along with the growth of the Internet, have expanded and deepened American popular culture. Of course, trends in popular culture have important ramifications for American social, economic, and political institutions and practices. Lott received his Ph.D. from Columbia in 1991. He earned his M.A. from Columbia in 1984 and his B.A. from the University of Missouri in 1981. Lott has received numerous awards, including the MLA Best First Book Prize and the Myers Center for Human Rights Book Award in 1994. Rector Science Complex, Stafford Lecture Hall – 7:00 p.m.
New technology standards will shortly be finalized for the World Wide Web. These standards will transform the Web as we know it, permitting wide-spreadintegration of data, across an expanding range of Web sites and devices, and an explosion in the number of Web site creators and consumers. This future Web will be rich with disruption, opportunities, and challenges. The Internet has become part of the daily lives of many people and organizations around the world. Emerging as one of the key dimensions of a globalized world, the Internet is accessible on many different types of devices, including cell phones and personal digital assistants. The World Wide Web was created in 1989 by Sir Tim Berners-Lee, a British scientist working at the European Organization for Nuclear Research (CERN) in Geneva, Switzerland. Today, a strong force behind the promotion of a â€œWeb for Everyoneâ€ is the World Wide Web Consortium (W3C). Tim Berners-Lee and others created W3C as an industry consortium dedicated to building consensus around Web technologies. &#8226 Web on Everything including mobile phones, smart phones, personal digital assistants, interactive television systems, voice response systems, kiosks and even certain domestic appliances. &#8226 Knowledge Base that is more than just an immense book of information. It will also be a vast data base that, if designed carefully, can allow computers to do more useful work. By developing a Web that holds information for both human and machine processing, W3C aims to enable people to solve problems that would otherwise be too tedious or complex to solve. &#8226 Trust and Confidence is needed for the Web to be a useful medium for social transactions. While technology cannot guarantee trust, it should enable secure transactions with trusted parties, be they people, organizations, or services. Steve Bratt is the Chief Executive Officer at the World Wide Web Consortium where he is responsible for the organization’s world-wide operations, overall management of member relations and many other duties. The World Wide Web Consortium concentrates on long-term web growth. By formulating standards that reinforce the importance of Web compatibility and global consensus, the organization works to help create a Web available to everyone. Before joining the consortium in 2002, Bratt performed many roles throughout industry and government. In 1997, he was named coordinator of the Comprehensive Nuclear-Test-Ban Treaty International Data in Vienna, Austria where he was responsible for establishing the data center and creating standards for data exchange between 300 world-wide sensors and 170 nations. From 1984 to 1997, he spearheaded research initiatives first at Science Applications International Corporation and then as a program manager at Defense Advanced Research Projects Agency. Bratt received his bachelor’s degree from Massachusetts Institute of Technology and his doctorate from Pennsylvania State University. This program will focus on how technology, law, and new consumer habits are changing the way we learn about the world, and what these changes will do to the way we live, work, and choose our leaders. With electronic media available to increasing numbers of citizens around the world, how do people receive breaking news and crucial information? Important television news reports are broadcast live across continents; many newspapers printed and delivered to homes or bought at a newsstand can now be accessed on the internet either at no charge or with online subscriptions. What effects do these changes have on the way that the news media portrays current events? Do these depictions encourage the public to base their decisions and views on a single information source? Do laws regulate the information accessed by the public? How does the media impact the way we think about and view the world? Certain news stations may offer more conservative views than others. Some may choose to cover a story to a certain point but omit information the public might find useful. Some papers and television news stations portray stories from perspectives which might encourage people to rely on one source for all news coverage. Some laws may restrict the publication of certain information, resulting in limited public knowledge. Whether we like it or not, media is present in our everyday lives. We need to consider the positive and negative effects the ever-growing media has on us, and whether change is necessary. Stephen Adler is an accomplished journalist and has been the editor-in-chief of BusinessWeek since 2005. He began his writing career reporting for The Tampa Times and The Tallahassee Democrat. He then joined the American Lawyer Magazine, where he became editor and eventually editorial director of the American Lawyer newspapers group. Adler was a National Magazine Award finalist for his article on the Union Carbide accident in the American Lawyer in 1985. After a few years with the publication, Mr. Adler became legal editor of the Wall Street Journal in 1988. Adler and a colleague were given a merit award in the John Peter Zenger Media Awards Competition in 1993 for an article they wrote entitled â€œCommon Criminals.â€ He received several promotions at the Journal, and in 1998 became assistant managing editor. During his time with the Wall Street Journal Mr. Adler directed reporting teams which won three Pulitzer Prizes. He was promoted to deputy managing editor in 2000, expanding the Journal on the internet and in other media, directing news coverage in the daily edition and supervising the Wall Street Journal Books imprint, a division of Random House Publishing. In 1994, Times Books published Mr. Adler’s The Jury: Trial and Error in the American Courtroom, which won the American Bar Association’s Silver Gavel Award in 1995. He also co-edited two books with his wife, Letters of the Century (1999) and Women’s Letters (2005), both published by Dial Press. Mr. Adler is on the board of directors for one of New York’s original settlement houses, the Goddard-Riverdale Community Center. In 1977, he received his bachelor’s degree from Harvard College and in 1983 earned his juris doctorate degree from Harvard Law School. The Benjamin Rush Award for Humanistic Values in Corporate and Government Life, established in 1985, is one of the most prestigious annual awards presented at Dickinson College. The Award celebrates the achievements of officials and executives who have reached the highest levels in government service or the corporate world. It is named in honor of Benjamin Rush, the prominent colonial Philadelphia physician who was a signer of the Declaration of Independence and founder of Dickinson. The Award is conferred at a public ceremony on the Dickinson campus, during which the recipient presents the annual Rush Award Lecture. The lectureship guidelines stipulate that the recipient should comment on issues of significance to government or the corporate world, with some attention to the value of the liberal arts in preparing individuals for responsible citizenship. The recipient of the Award is presented with an honorarium and a bronze medal bearing Rush’s likeness. Prior to the Rush Lecture the college hosts a reception and dinner in honor of the recipient. A majority of the poems in Here, Bullet were written during Turner’s one-year tour in Iraq and reflect the struggle to understand his place in the War and the world. This first-hand account of the War in Iraq stands as a powerful witness to the actual events of the War. The poems are neither politically skewed nor do they make moral assumptions. Instead, they leave the reader to draw conclusions and feel the poetry. 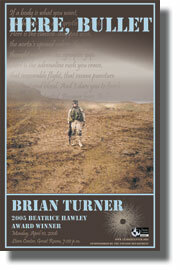 The first and only of Brian Turner’s published books to date, Here, Bullet has garnered national acclaim. Both author and poetry have been featured in many publications and radio broadcasts, including Maine Things Considered and NPR. Here, Bullet is the recipient of the 2005 Alice James Books’ Beatrice Hawley Award. After earning an M.F.A. in poetry from the University of Oregon , Brian Turner began a life of travel. He lived in South Korea for a year before serving seven years in the U.S. Army. He was deployed to Bosnia-Herzegovina from 1999-2000 with the 10th Mountain Division and most recently to Iraq from 2003-2004 with the 3 rd Stryker Brigade Combat Team, 2 nd Infantry Division. There, he was stationed near Mosul and was a team leader in the first Stryker brigade to enter the combat zone. His poetry has been published in Poetry Daily, The Georgia Review and other journals, and in the Voices in Wartime Anthology published in conjunction with the feature-length documentary film of the same name.